Since the completion of the Colorado Avenue Streetscape Project a few years ago, the Colorado Avenue Business District of Downtown Stuart has seen a renaissance with renovated and restored buildings, new businesses, and an exciting new energy along the corridor. Come hear first hand from some of the businesses that relocated to the district, and new plans to continue promoting arts and entertainment in the district at the March 28 Mornings on Main Street. 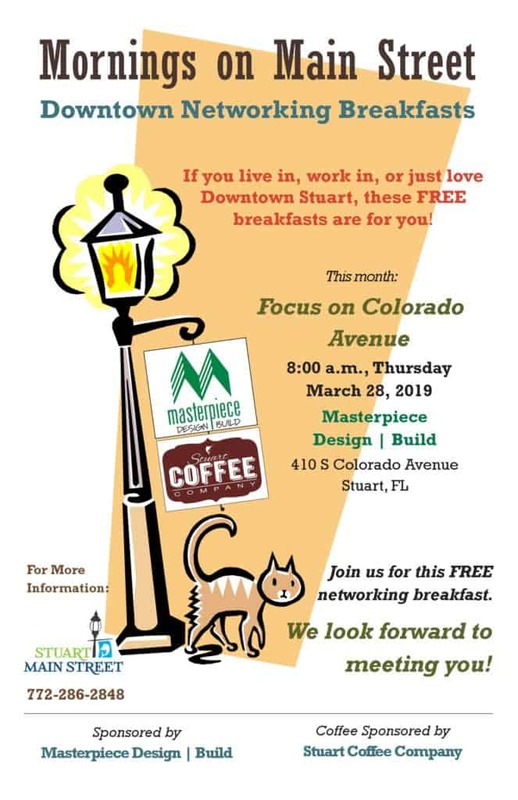 Sponsored and hosted by Masterpiece Design|Build at 410 S Colorado Avenue, the FREE networking breakfast is an ideal place to meet others who love Downtown Stuart and learn about what is happening in the district. Breakfast is from 8:00-9:00 am with speakers at approximately 8:15.